She read the introduction, pages 1-2 and then she turned to the back of the book and went over the vocabulary. Some of the words were unfamiliar to her, so she looked them up in the dictionary and learned how to pronounce them. We went over this week's words. I especially wanted her to note the difference between elements of design and principles of design. After that she read pages 3 and 4. We discussed, in some depth, the design process pictured on page 3. During the rest of her time, she completed one row of a value scale on a shading exercise sheet. Additionally, we used for Day 2, Pages 4-6 this painting for further practice on "Line"
Today was about "line" an element of design. She read pages 4-7. We discussed the different types of line that are found in a work of art. Prior to the lesson, I printed the painting, Christ at the Sea of Galilee by Tintoretto and after going over the lesson, I handed the print to her. She found the 4 types of lines represented in today's lesson and she drew over the lines with a gel pen. After that, she did Activity 1.1. The shading exercise is not a required part of the AOP Art book. It is an art practice drill that I assigned in addition to the regular work. Today was about "texture" another element of design. She read pages 8 and 9 and she did activity 1.2. She had to find 10 or more different textures and make rubbings of them. 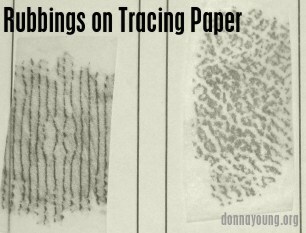 She made the rubbings on vellum instead of directly on the page of the book. She had to practice a bit before she got the hang of it. She used different pencils to see which ones worked best. We took the rubbings outside, pinned them to a box, and sprayed them with fixative. We left them outside in a sheltered area to dry overnight because of the odor. Lastly, she completed one row of a value scale on her shading exercise worksheet. Holly took rubbings from these items: lace curtain, the floor, the wall, table top, an embroidered item, embossed cloth covered hardback book, a coin, a comb, a ruler. Today was still about texture. I brought her rubbings back inside the house. She read page 11 and completed activity 1.3. This required that she choose 6 of her rubbings and try to reproduce them by drawing them in her book. She found the assignment difficult. Later she finished activity 1.2 (from yesterday) by cutting out 10 of her rubbings and gluing them onto the 10 squares in her book on page 9. The topic today was "value" and because of limited time she completed page 13 and nothing more. Below are links to two choices in vellum or tracing paper and two choices of pencil brands. The use of vellum for day 3 was our choice, so this item is optional. Of course pencils are not optional and below are two good brands. Drawing pencils can be purchased locally from art stores and online. I purchased materials from Blick Art Materials and Amazon.